I’ve had a great deal of trouble coming to terms with losing someone that meant so much to me personally and professionally. She was my mentor and my best friend. 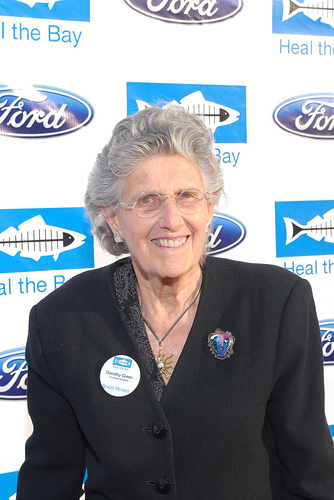 Her life proved that one person can truly make this world a better place and her impact on California’s coast and watersheds was unparalleled. I’m overwhelmed by the irony of remembering Dorothy while the state of California urgently tries to replumb the Delta without demanding water use accountability from Ag. Even if urban residents stopped using water tomorrow, California would still be in a water crisis because Big Agriculture uses about 80% of the state’s water and we have over five times more water rights than we have water. The system is completely broken, and engineering solutions alone won’t solve our water crisis. Dorothy had incredible common sense and that’s just what we need to fix the problem. As much as Dorothy would want me to honor her memory on the anniversary of her passing by focusing on the fight for clean water and protected aquatic ecosystems, it is important to reflect on what Dorothy meant to all of us. She inspired us by taking on the most complex, lost causes and fighting for common-sense solutions. I can’t tell you how often I’ve reached for the phone in the last year to ask her advice on a complicated issue. Asking myself “What would Dorothy do?” is a commonplace occurrence. Dorothy made time for everyone and she had the extraordinary ability of making everyone she worked with on an issue or project feel like the primary reason for organizational success. You could always lean on Dorothy. In fact she thrived on it. Dorothy was so comfortable in her own skin. She could talk fearlessly to people about water from Hollywood, city hall, Sacramento or Congress. To so many people, she was the credible voice for our right to clean water. Today, many people pay tribute to Dorothy in their own way. Some may go to the beach and look at the Bay that she spent so many years healing. If it rains, others may go to Ballona Creek or the L.A. River to remember why she fought so hard to clean up urban runoff. Some may send an e-mail to their Assemblyperson or Senator asking them to oppose the water bond and plan to replumb the delta until true water rights reform and statewide conservation are part of the package. Some may just choose to wear a Heal the Bay t-shirt. Personally, I’ll remember Dorothy by looking at old photos and newsletters, maybe having lunch with some mutual friends, and talking to my kids about how Dorothy gave me a special chance to be part of a movement to protect the environment for generations to come. Fabulous tribute to a fighter who had class. No matter how difficult the obstacles may appear, the quest must continue. California may lose some great leaders, but new leaders are standing up in their places. Be encouraged and strengthened! That was a powerful tribute. Thank you. I wish things made more sense as far as the water crisis goes. I did not know Dorothy, but from what I have read I envision her as the leader of the cause. If ever the Delta becomes protected and restored, we will owe it to her vision and hard work.